As Your Online Machine Shop, we are taking the necessary steps to ensure the quality and safety of your parts. We take U.S. national safety seriously and have registered with the U.S. Department of State, Directorate of Defense Trade Controls (DDTC) to be International Traffic in Arms Regulations (ITAR) compliant. ITAR is a set of U.S. government guidelines that address the export and transfer of domestic items and technologies to protect the interests and safety of the United States, while maintaining a trade relationship with broader international community. To learn more about ITAR, please visit the DDTC website at https://www.pmddtc.state.gov. If you have questions for PartsBadger regarding ITAR and how it relates to our business, please call us. By clicking the button, you will be redirected to a secure submission form. Everything we do has the goal of increasing the speed at which our customers receive quotes, get responses to questions, and get their parts. We’re here to change the custom parts game by changing how you get your parts. Instant quoting, quick delivery, and awesome prices help bring your ideas and inventions to the world. We will respond to your needs – no matter what it takes. We are determined to get you your parts quickly, correctly, and at the right price. We’re here to help with a smile on our face. We’ve been where you are – in need of a custom part in order to move forward. We make a once frustrating process fun. PartsBadger takes pride in the vast amount of information we have available. Want a breakdown of aluminium types? See what finishes we offer? No problem. Click above and dive in to some of our excellent process and material information. Easy, Fast, and Affordable. These are core ideas that drive every person here at PartsBadger. Based near Milwaukee, WI, PartsBadger can have your machined parts shipped quick to meet your schedule. 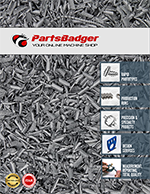 Stay up to date with promotions and new services provided by PartsBadger.